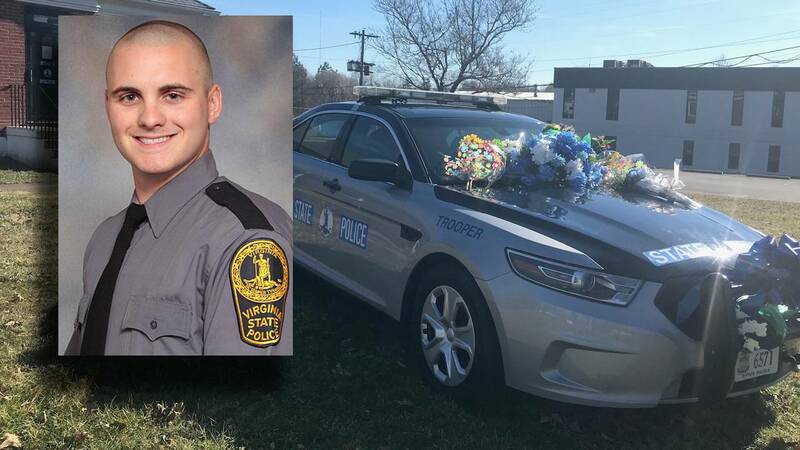 WYTHEVILLE, Va. - It's been two months since Virginia State Trooper Lucas Dowell was killed in the line of duty. On Sunday, a California-based nonprofit drove to Southwest Virginia to keep his memory alive. Losing Dowell will never be easy for his fellow troopers, no matter how much time goes by. "It's very difficult to deal with a line of duty death in any department," said Sgt. Rick Garletts with Virginia State Police. On Sunday, a dozen officers from the West Coast came to Wytheville so they could grieve alongside state troopers. "Every call for service that we have, we don't know what we're walking into, but it's somebody's worst nightmare and sometimes it becomes our worst nightmare too," said Grant Ward, with the Cannonball Memorial Run. The run is a three-day drive from California to Washington, D.C. where they stop along the way to honor fallen law enforcement officers. The group braved the rain to make it to Dowell's home district, their last stop before reaching the nation's capital. "Arriving in each one of these locations is reopening a wound, but the more we reopen that wound, the more we can start to heal," said Ward. The troopers who came to Wytheville said it's impossible to describe what it's like to lose one of their own, especially someone as beloved as Dowell. "We're all brothers and sisters in law enforcement, and it hurts a little more knowing he was from here," said Sgt. Troy Dalton, with Virginia State Police. If times like this are any indication, his memory will not be forgotten as these troopers already have Dowell on their minds every time they report for duty. "We remember him by going to work every day and remembering his commitment to this job that we are still here to do," said Garletts.